We're waiting until Fulham give out the tickets and unfortunately there's not a lot to do but sit around in the town square. 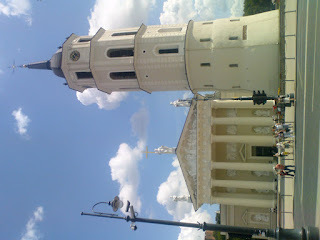 The picture is of the cathedral and separate bell tower. The Fulham supporters have colonized the café behind us and we're just lounging in the sun. After we get the tickets we'll start looking for some thing to eat. More later!